Orville Bulman’s paintings are joyful, whimsical and playful. 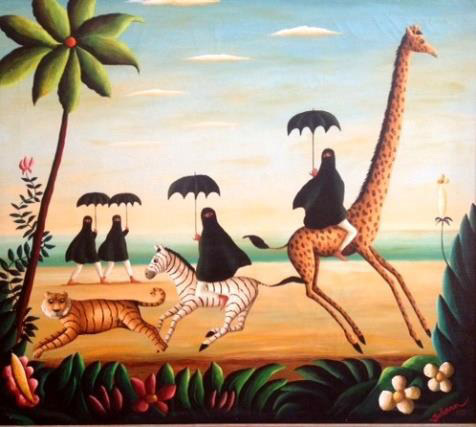 It’s hard to imagine that his paintings of lush jungles, tigers, giraffe and elegant Haitian women and men, were created by a businessman who was born and raised in Grand Rapids, Michigan. There was an expectation that Bulman would run the family business, founded by his father, E.O. 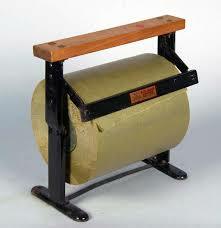 Bulman, who invented the Bulman Paper Cutter and other products that became staples in grocery stores everywhere in the early twentieth century. After high school graduation, Bulman worked as a cartoonist for a Chicago newspaper, then dutifully returned to Grand Rapids to help run the Bulman Paper Company. 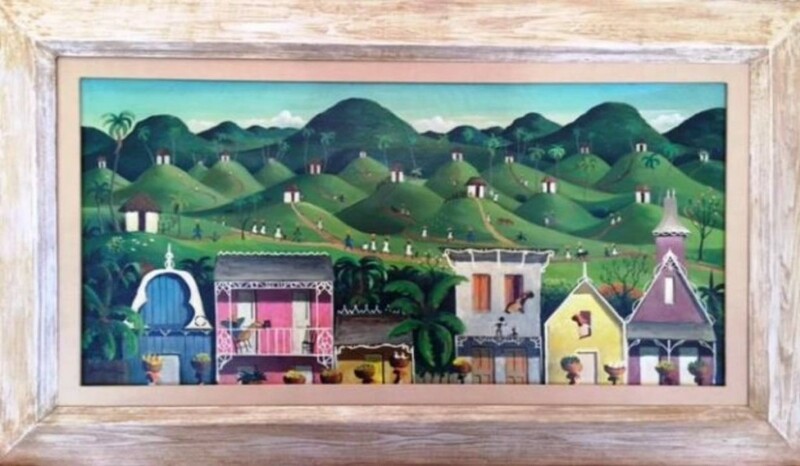 A self-taught artist, Bulman helped his father run the company and continued to paint when he could. Some of his early works were regionalist in style and subject. It was around 1946, after a neck injury requiring traction, but allowed him to paint, that Bulman began to spend winters in Palm Beach. Many of his paintings during the 40s and 50s were touching scenes of the segregated South. It was a chance viewing of pictures of Haiti, in the 1950s, that stirred Bulman’s imagination. 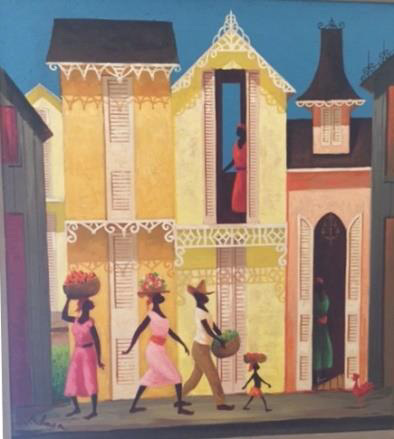 At first he painted from photographs, but he visited Haiti in 1952, staying in a small village and incorporating his travel experience into his imaginative works. Bulman began to exhibit his works and both Newsweek and LIFE featured his paintings in their magazines. 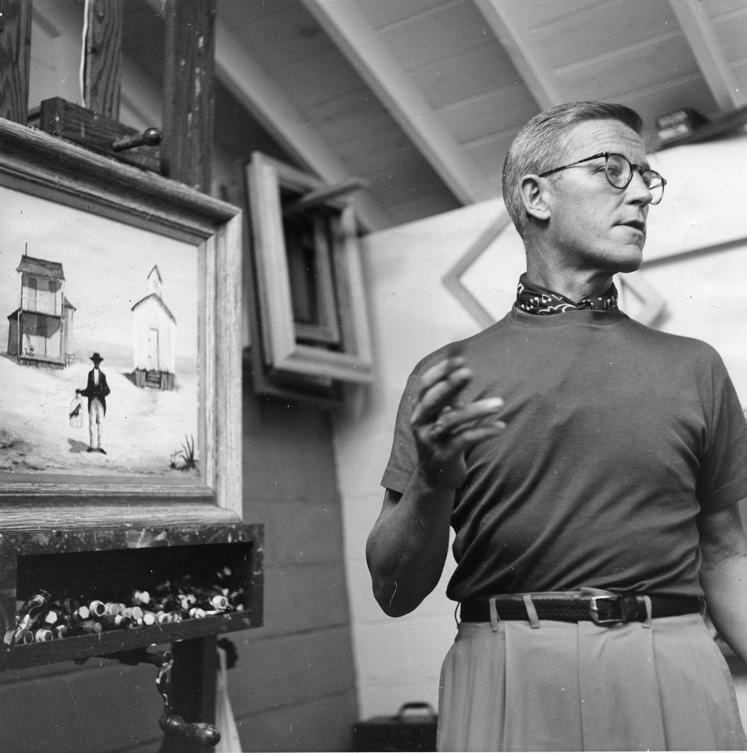 In 1954, at the age of 50, Bulman was president of the company and also exhibited his paintings at art galleries in New York and other cities around the U.S. He spent winters in Palm Beach and summers in Grand Rapids, becoming both a successful business owner and artist. The recurring themes in Bulman’s paintings reflect an imagined land of fantasy, with lush foliage, fanciful boats and graceful humans. Chapeau Fastueux is just one example of the world he created, with the sumptuous colors and playfulness that made his works popular with everyone from the Duchess of Windsor to Hollywood celebrities.  Please contact us for more information about Chapeau Fastueux or any of the other fine works by Orville Bulman for sale in the Surovek Gallery.